Written by - Steve Pritchard, Mike Kelly. 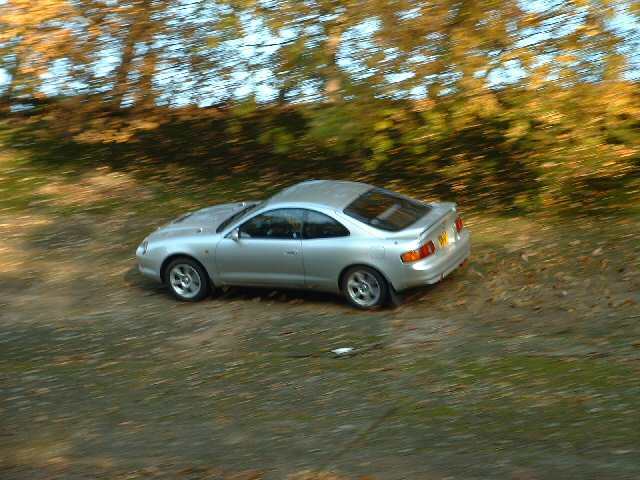 The inaugural meeting of the GT-Four Drivers Club was held at Brooklands Museum on a beautiful sunny Saturday in December. 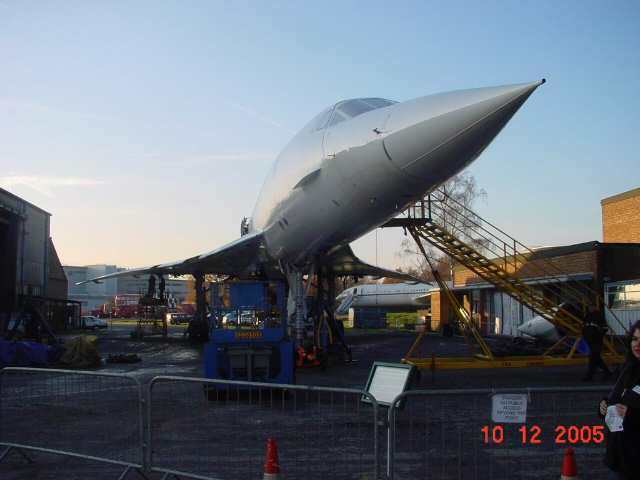 In preparation for our visit, Don our events organizer had contacted Brooklands and arranged not only a small discount for entry to the museum but also official access to the one of the few remaining sections of the historic banking for photo's. 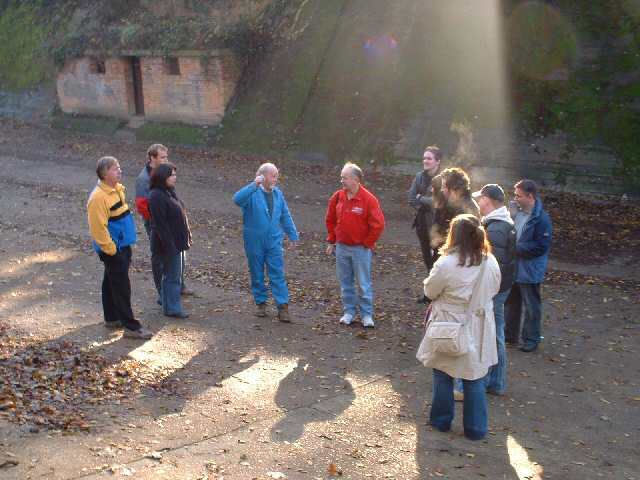 After the majority of folks had parked up a volunteer at the museum arrived to give us a talk about the history of the site and circuit which was very informative. 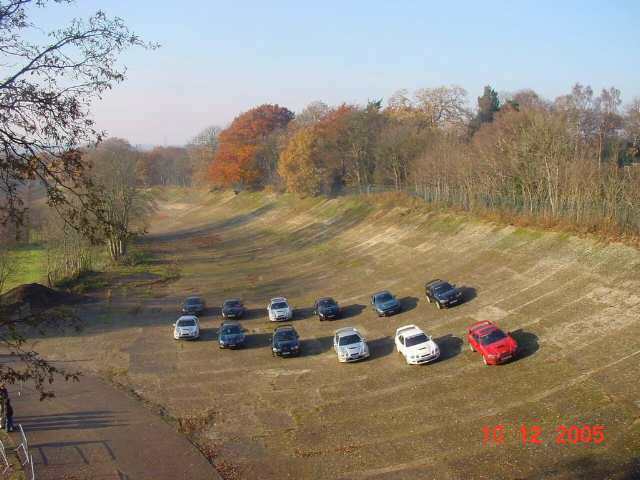 The GT-Four Drivers Club then truly lived up to its 'driving' tag line by having a go at driving on the banking after receiving some helpful tips and supervision from the Brooklands staff. While speeds were not exactly 150+mph that the cars of old managed it was nonetheless a rare privilege to be granted this level of access and we are very thankful to Brooklands for giving this opportunity. 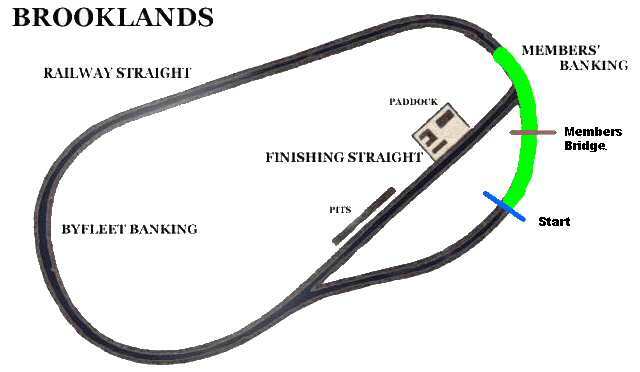 The circuit is laid out as below. The section we were able to drive on is part of the members curves highlighted above in green. 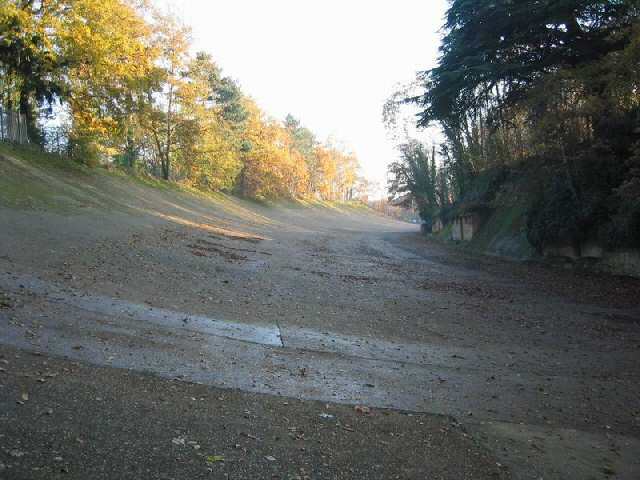 Sadly much of the circuit has been demolished and redeveloped but much of what remains can be seen in the photographs. 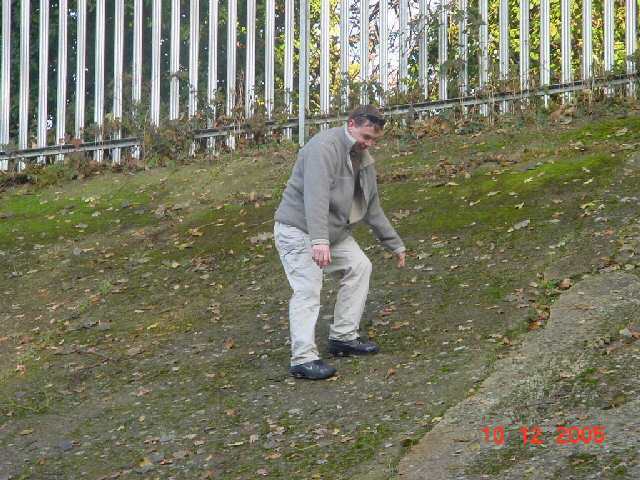 The track itself is spectacularly steep, a fact not easily grasped until you have attempted and failed to climb to the top of it as Steve kindly demonstrates here. 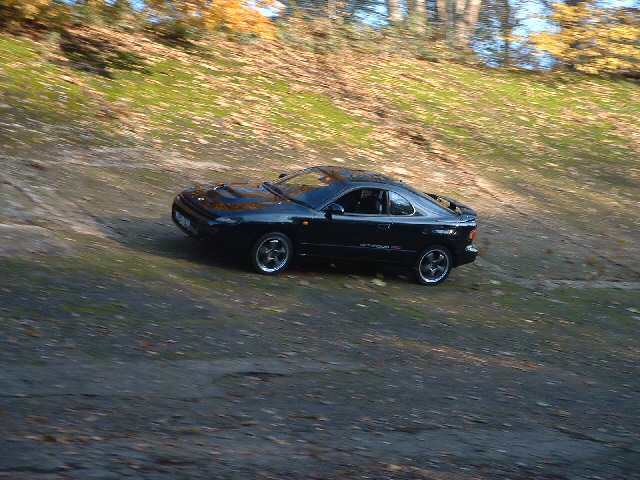 The top section of the banking must be approaching a 40 degree slope! Another fact that most (authors included) did not appreciate is that on the far side of the banking there is a sheer drop of some 30 feet to ground level not a nice dirt run off level with the top edge. As we were shown round the banking section our museum guide regaled us with tales of cars going over the top and coming to rest in the treetops! Sadly the track condition is not what it used to be in the old days. Lack of use means that it has now become quite mossy and is hence alarmingly slippery. In places the surface has also become very uneven with the occasional 2-4 inch step between concrete slabs that make up the surface. These factors, combined with the tales of old day accidents left everyone slightly apprehensive about driving the banking. Having been given a few instructions on line and speed by our guide the call went out - Would all drivers who wish to do so please go and bring their cars. 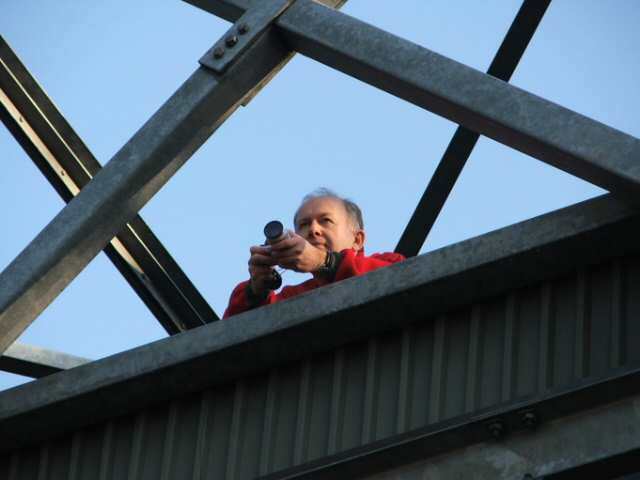 The instructions were to set out from the start point (shown above) aim to get to 10 feet off the top of the banking between there and members bridge and then stop again. The expectation was set to use plenty of right lock and brake very slowly. And this is the run off area for anyone who didn't manage to slow down in time! Unfortunately this section of the track is in very poor condition as mentioned above and is not suitable for driving on at speed. So bearing all this in mind drivers collected their cars and took them to the far end of the banking ready for their runs. And in true Murray Walker style, its go, go, go! Thanks to Don our eye in the sky (well, on the members bridge at least)... we are able to present - A view from the (members) bridge. Cameras exhausted we then toured the museum Which has numerous exhibits ranging from bicycles through the completely bonkers Napier Railton to one of the original prototype Concords. 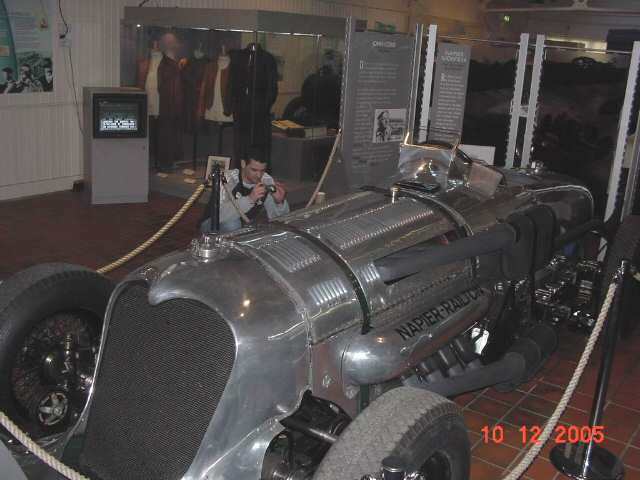 The Napier Railton 24 litre W12 165mph with no front brakes! More information on the Brooklands Napier Railton web page. Having spent a couple of hours touring the visit was finished with a visit to the onsite tea room after which finally headed back to the car park. 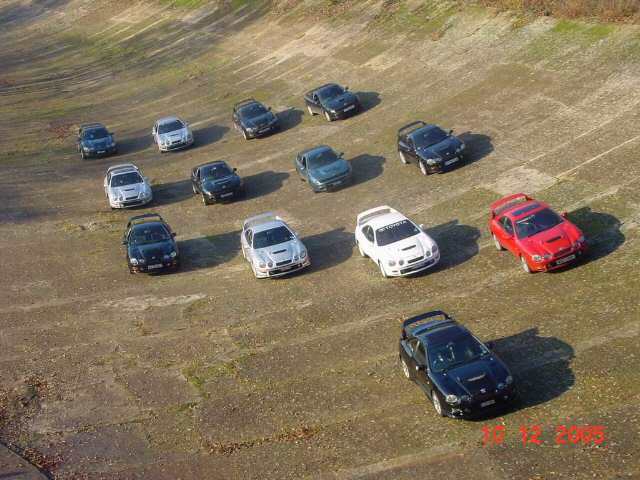 During the usual car park mooching the meet took a hard left turn. While we were standing about we watched an old Routemaster bus heading out on to the banking. Somewhat jokingly we asked the driver if he was going round the banked section - His reply of yes was somewhat unexpected. Worse than that he offered to take us all round on the banking for a charitable donation. After a few minutes of pocket digging said donation was made. 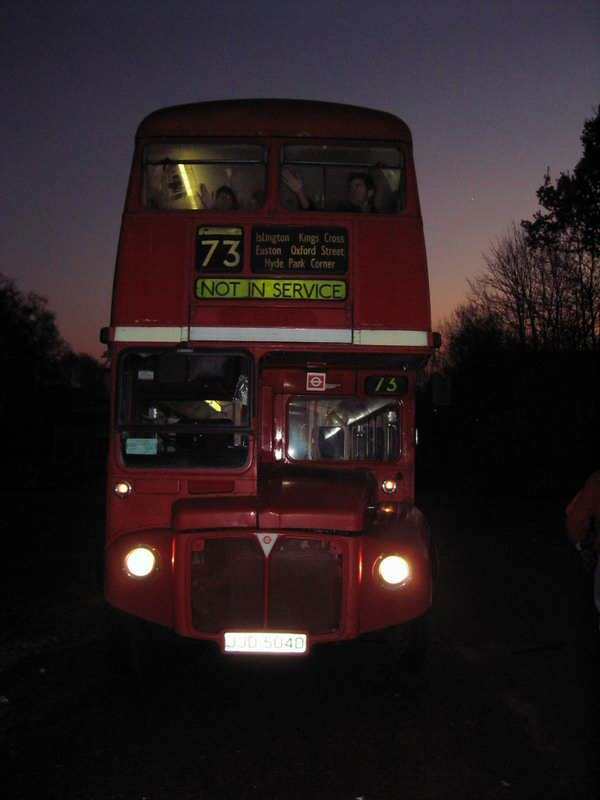 Going round the banking in a Routemaster was somewhat unusual. Sitting on the top deck the angle of lean was quite alarming to say the least! Still we all survived and made it back to the parking in one piece - an experience that will be with us for a long time I am sure. It certainly made for a day of extremes. We started off in 150mph coupes and ended up on a 50mph bus. 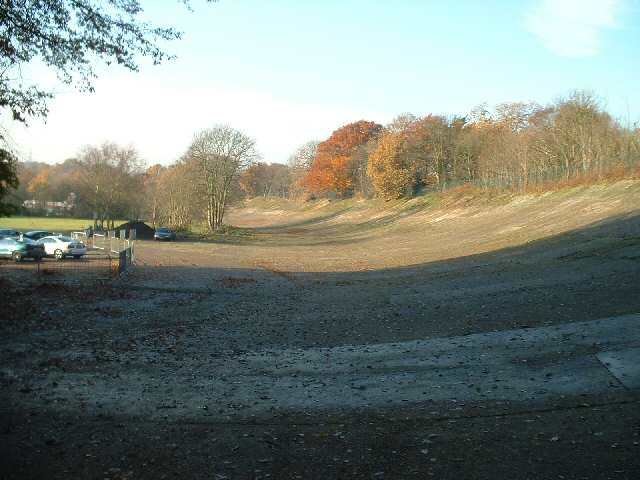 There can't be too many folks who have driven the famous Brooklands banking in a bus but it certainly rounded off the visit nicely. 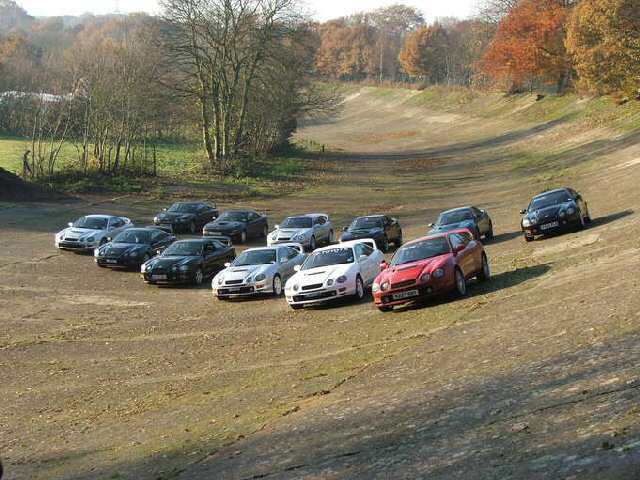 The GT-Four Drivers Club wishes to extend its gratitude to the staff of Brooklands Museum who made us most welcome. The Club staff would also like to extend their thanks to all the members who attended.